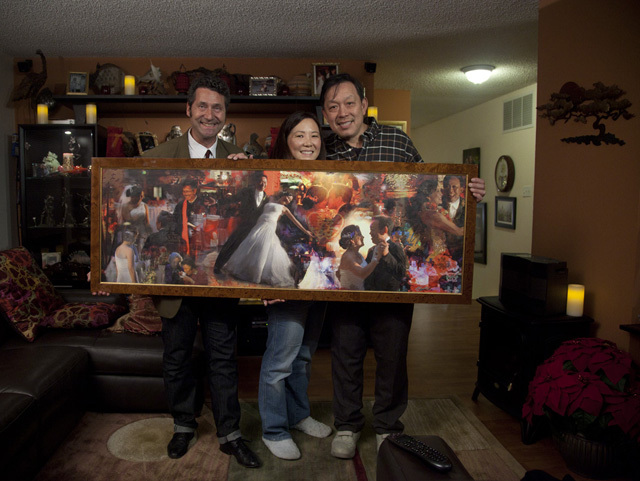 I recently had the pleasure and honor of being commissioned by Mary and Jamie to create a very special wedding present, a Wedding Day Collage Painting, for their good friends, world-renowned wedding photographer and international instructor Hanson and Annette. 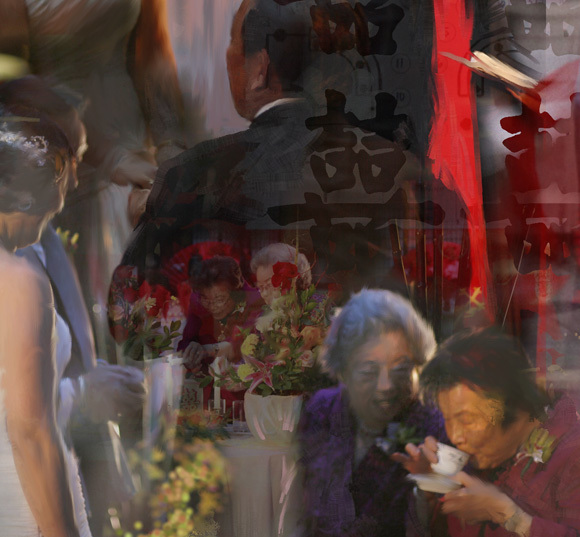 The painting encompasses and captures the significant moments and symbols of their wedding day, including the beautiful and touching tea ceremony with their mothers, their wedding cake and flowers that Annette designed, the bamboo that Hanson arranged, the table settings of their family table no. 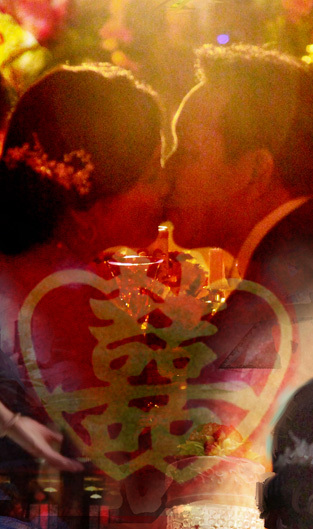 2, their first dance, and the Double Happiness Chinese character. It was a great joy to see the expression of surprise and pleasure on their faces when they first saw the painting! They loved it! 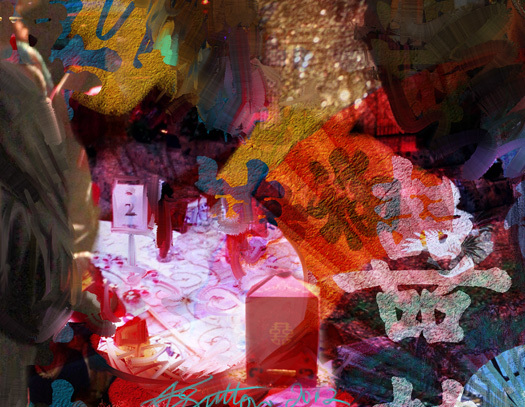 I shall be using this artwork as one of the examples in my new Painter Collage Techniques DVD. Your work is truly a living thing, moving, breathing….like no other. You truly inspire me as a painter. 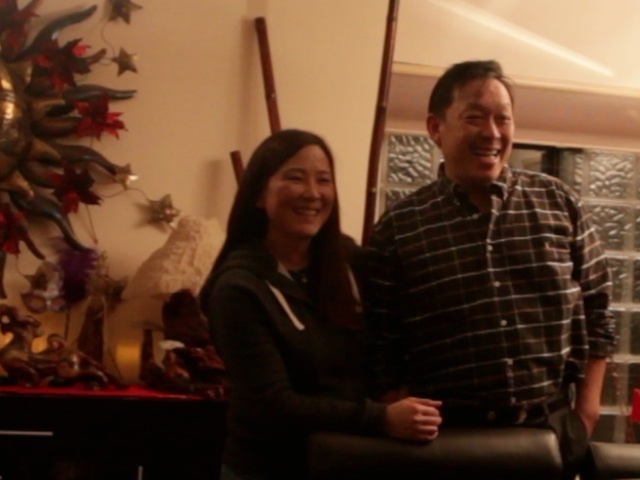 Jeremy, I aspire to have talent like yours, and love the warmth this painting makes me feel for the fortunate couple! THANK YOU For Sharing -this is magnificent!- Your work is a true inspiration for me ! Love it Jeremy. Love the many layers of light and beyond.